You are here: Home / Organic Gardening / Vegetable Garden / How To Plant Corn – Weed-Free! 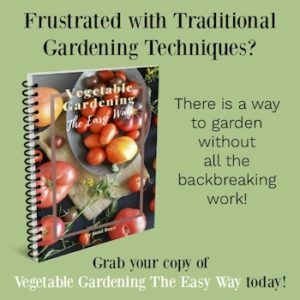 I’ve heard from so many people about the back-breaking weeding they’ve either had to do growing up or in their own gardens – and I’ve made it my goal throughout the life of this blog to show that you can grow vegetables without a lot of weeding (see my whole category on weeds here). 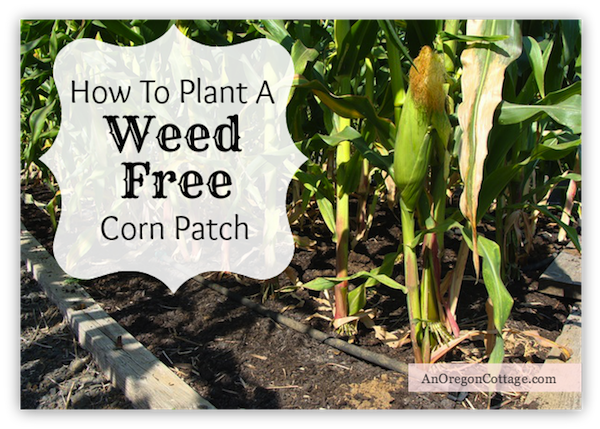 I grow corn, beans, and potatoes in large-ish permanent beds (10′ x 20′), and while I’ve written about theses beds within other posts, I felt there was a need for an dedicated post just on how to plant corn to be weed-free all season. There aren’t many things worse for a gardener than trying to find sprouting corn in a sea of weeds – and then trying to free the poor things from them. Think I’m stretching the truth? Well I’ve got pictures to prove it! I’ve been planning this post since last year – taking pictures of a whole season of planting and growing corn so I could share it with you. Cover the future corn bed with black plastic at least two months before corn planting time for your area, securing it with rocks. When you lift the plastic months later, you will find a pile of dead vegetation that you simply rake up and add to your compost pile. 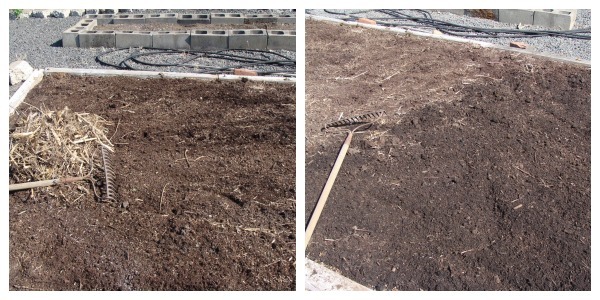 Then spread a 2-4 inch layer of compost over the bed, without tilling. The only time I turn the soil are if I find areas with vole or mole holes – it’s my sad attempt to hinder their movement. Make a furrow with a hoe about 4-5 inches deep – this is the only place you break up the soil, and it’s pretty simple with the hoe. 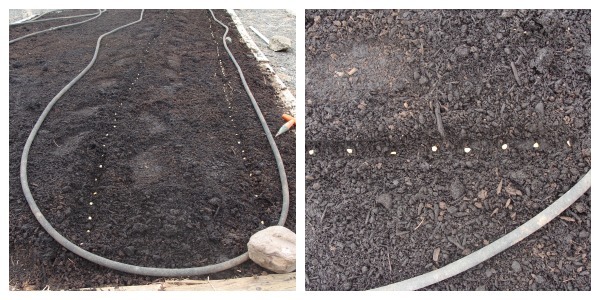 Add a line of organic fertilizer in the furrow and partially fill the furrow back to about 1-inch deep. In my 10′ wide bed, I plant 4 rows about 2 1/2 feet apart. Add corn seeds 2-3 inches apart. Seeding fairly thickly like this is my trick to ensure an even corn patch – between corn’s often spotty germination and the birds, I had some empty rows before I started sowing this way. 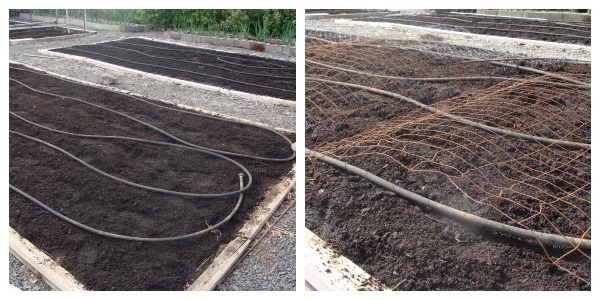 Lay soaker hoses along each planted row and water the seeds well (lest you think this isn’t important: soakers – or drip sytems – are the only way to not get water between rows…and the weeds that want to grow there). Optional: If you have birds or cats in the neighborhood, covering the beds with chicken wire or whatever you have will help keep the beds pest-free. Thin the corn to 12-18 inches apart. Yes, you will be pulling sometimes lovely corn and throwing it away. If you’ve read here long, you know this pains me, but it’s the only way to get full sized stalks with full ears – the only way. And it’s better than empty spaces. So bite the bullet and just do it. Water with the soaker hoses for about 4 to 5 hours every 4-7 days deeply to encourage deep root growth (shorter watering every few days results in shallow roots and stalks that will topple when full of ears if a wind comes up). 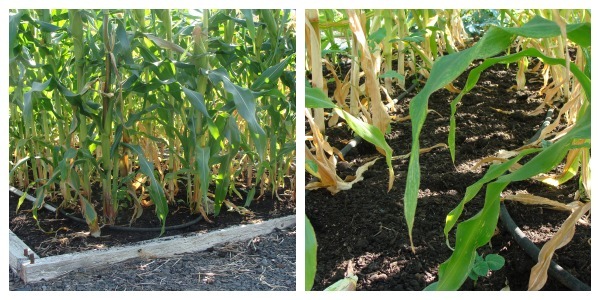 If in doubt, dig an inch down – if it’s moist, the corn has enough water and can wait for a day or more to be watered. You may see a weed here or there (in the photo on the right there’s one in the front) that you’ll need to pull casually as you’re hooking up the soaker hose. At the end of the season the bottom leaves may yellow like mine did after two months of warm, dry weather, but the rest of the stalks are a healthy green with ears growing full, so don’t worry if you see some dead bottom leaves on your plants. This is the full-grown corn patch at the end of the season – the ears are ready for harvesting. Do you see that soil? Yeah – no weeds. No hoeing. No tilling. Lots of corn with very little work – what’s not to love about that? As far as the varieties of corn I grow, I always plant two beds with three different varieties that mature 2 weeks apart so that we’re not inundated with corn all at once. This gives us about a month of harvest and I can easily prep and freeze smaller amounts and not kill myself processing corn. The last few years I’ve liked ‘Quickie’ as the earliest variety (about 65 days), ‘Bodacious’ for a mid-season (75 days), and Incredible as the tallest, and latest (85 days). 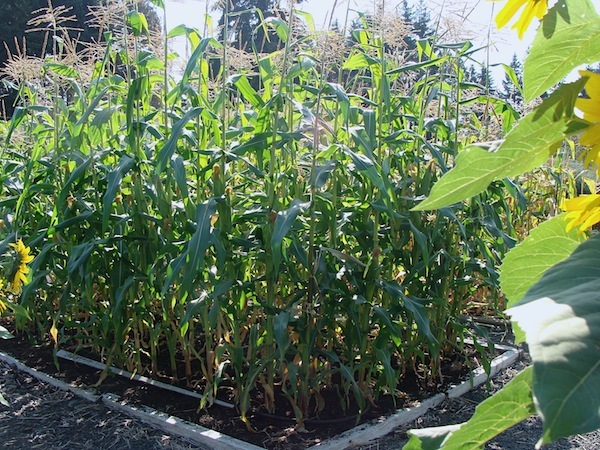 So, there you have it – there is a way to grow corn and not have to spend a lot of time weeding! 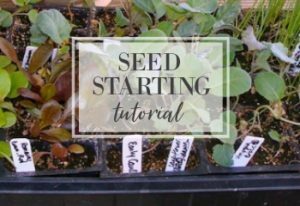 I do know that some of you don’t want to stop tilling, and if you do, just be prepared for all the weed seeds that germinate from being exposed to the air. I would suggest using newspaper and straw in between the rows so at least you don’t have to spend time weeding the paths. Do you grow corn? 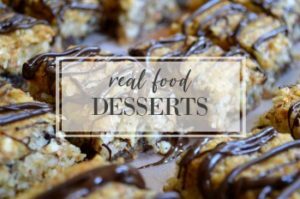 Do you have any tips and techniques to share with us that you like? Thanks for your great info and pictures about no-till. I love gardening but hate weeding and halfway thru the summer I give up. I am going to try no-till this year! Great – I think you will LOVE it, Heidi! We are anticipating growing corn for the first time this season. My son, who works on a farm here locally, is convinced it will be impossible to keep the weeds at bay without an herbicide. I am truly hoping to learn that it can be done otherwise. Your post is quite encouraging! 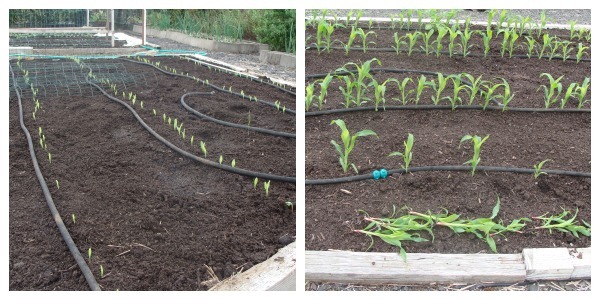 Here’s my dilemma: since we have never grown corn, we will need to start a new bed. I would guess this would require tilling. …and then I’m going to be stuck with a weed problem for sure. My question is, how might you propose starting a new bed? If I wait until the soil can be first tilled, and THEN cover with the plastic, I don’t think I will have 2 months to properly kill off all of the current weeds. I would greatly appreciate any ideas you would be willing to share! I think you will love this Hayley – it really does work! 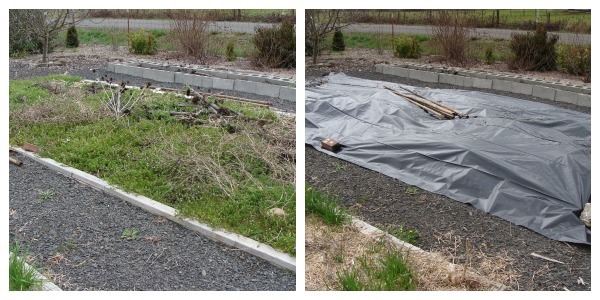 When we started the beds, we laid cardboard over the grass and layered that with horse manure (free) and then a clean garden compost we bought. The height was about 4 inches. We left that to settle for a couple weeks until it was warm enough for corn and then I went ahead and planted (just like I outlined here, with soakers on the rows). I have to admit, I didn’t think the corn would do as well since the available soil was only 4 inches – I thought maybe they’d fall over when grown. But they didn’t!! Corn is a shallow rooted plant, so that wasn’t and issue, and over the growing season the cardboard broke down enough that the roots grew deep enough to hold the stalks up. And being heavy feeders, the stalks loved all that manure. If you find several empty spots, could you transplant some of the little seedlings that you thin out into the empty spaces? I was wondering, after the corn harvest, do you pull up the dead plants? If so, does this deplete quite a bit of soil in the beds? I live in Keizer. My mom always planted part of a fish with each seed and only on the full moon! I’ve heard the fish idea before, Teresa, but never have fish to do that with! I actually don’t pull up the plants until they’re completely dead in late winter – ’cause I’m a lazy gardener and no one really sees the garden. 🙂 I do always let them turn completely brown and just knock them down, though, so by the time I put them on the debris pile, there’s barely any soil. I see you’ve joined the no till crowd. I’m not there yet, maybe someday. Oh and my mother-in-law gave me a aerogarden for Christmas. I have wanted 1 so much since you posted about yours a few yrs back. There is nothing like easy fresh herbs in the middle of winter. I wish I had room for corn. But your method is good for whatever you plant. Yael from Home Garden Diggers. Now that is valuable information! Thanks, Jami! Oh, so that’s how you do it! I am growing corn this year and I have been watering every other day. The corn is tall and lovely with little corn cobs starting to grow, but some of the tops are toppling over! I see where you say to deep water only about every 5-7 days. I will have to do that next year. Thanks for the tips about weedless growing and deep watering! I added a post in the hop party about our white and red carrots and potatoes grown in the compost heap. Thanks for hosting! Thanks so much for hosting! I’ve never tried corn, but my kids sure would like me to! Thanks for this! We planted corn for the first time this year. We have small garden space, so I just have 8 plants. I am wondering if I need to somehow assist with pollination and/or something about de-tasseling? I have heard farm kids talk about de-tasseling, but I don’t know if that goes for sweet corn or not. We haven’t grown corn in a couple of years. But I’m hoping it will make the list next year. I’ll have to try to do it weed free. Thanks for sharing.